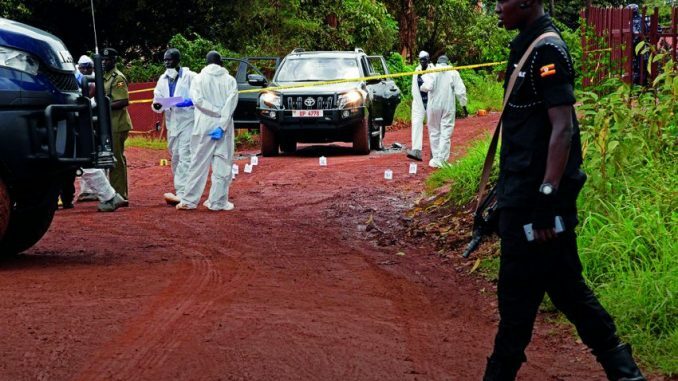 The Hollywood film style terrorist gunning down of a senior police officer in Kampala’s the latest in a pattern that has seen more than a dozen such killings over the last few years. Most of the victims have been prominent Muslims. But with few arrests made so far, Ugandans are bracing themselves for more gunplay on their streets. It was done in the style of a Hollywood film: three masked gunmen riding motorbikes stalked the official vehicle Assistant Police Chief Andrew Felix Kaweesi was travelling in for a while before showering it with bullets, killing him, his bodyguard and the driver on the spot – a short distance from his home. Kaweesi, who was assassinated in March this year, becomes the fourteenth prominent Ugandan to be killed in that fashion and style over the past few years. The stark difference is that 12 of the victims before him had been prominent Muslim leaders. Kaweesi was a Christian, like another victim, Joan Kagezi. Kagezi had been a state prosecutor of five al-Shabaab suspects charged with orchestrating the 2010 bombings in which 74 people were killed while watching the football World Cup finals on televisions screens in a Kampala city pub. Kaweesi’s murder comes on the heels of that of Sheikh Major Mohammed Kiggundu, who was killed in an identical manner in November last year. Kiggundu had been a senior officer with the rebel Allied Democratic Forces (ADF) before switching sides in early 2000 and becoming a spy for the Uganda security forces. In his earlier life, Kiggundu, a puritanical Islamic cleric, had been one of the main movers behind the establishment of the ADF. The ADF was formed by puritanical Ugandan Muslims belonging to the Tablighi Jamaat, who had merged with the remnants of another rebel group, the National Army for the Liberation of Uganda (NALU). The leader of the group was Jamil Mukulu, a former Protestant who converted to Islam. The ADF, branded a terrorist organisation by Uganda, also operates in DRC. On the day Kiggundu was killed, he had been on his way to an FM radio station to speak on a programme in which he condemned the rebellion he founded. He was gunned down to prevent him from “spreading more lies about ADF”, according to a message posted by the rebels. Since President Yoweri Museveni came to power through armed rebellion in 1986, his government has been fighting half a dozen rebel groups. In addition to building and equipping the national army, the Uganda People’s Defence Force (UPDF), the president has responded to pressure from civil society, especially religious leaders, to hold peace talks with rebel groups. The Uganda People’s Army, led by Brigadier Odong Latek and the Uganda National Rescue Front of General Moses Ali, signed peace pacts under which they agreed to end their rebellion and integrate into the national army. But that approach has not worked with some of the rebel groups, whose ideology is irreconcilable with that of Museveni. The ADF are fighting for the establishment of an Islamic nation ruled under sharia law. To weaken the group, Museveni opted for a carrot and stick policy under which dozens of ADF leaders who agreed to abandon the rebellion were given amnesty, cash handouts and government jobs. Maj. Kiggundu was one of them. When he quit the rebellion he was given an undisclosed amount of money as a “resettlement allowance”. He was deployed in the UPDF military intelligence section and promoted to the rank of major. The decision by some ADF leaders to quit their rebellion in exchange for money and jobs angered those who remained behind, who accused the defectors of abandoning the cause. At the end of 2010, Sheikh Jamil Mukulu, the supreme rebel leader, issued a fatwa for all the defectors to be killed. The first victim was Sheikh Abdul Karim Sentamu, Uganda’s renowned expert on Islamic hadith, and interpretations of the Quran. He was gunned down in 2011, several months after he quit ADF. The leader of Shia Muslims in Uganda, Sheikh Abdul Muwaya, was also gunned down in the Lake Victoria Mayuge district a few months later. The biggest worry for Ugandans is that the rebel group, which had earlier been confined to the jungles, seems to have become an urban-based terrorist group. A senior military intelligence officer who declined to be named told New African that the ADF, which has come under persistent military attacks on its positions in Eastern DRC by UPDF, has transformed from a conventional rebel force into a terrorist group with no frontlines. The rebels have been scattered across the East African region. The officer says he suspects the ADF now has hundreds of operatives around Uganda, especially in Kampala city, from where plans to eliminate their victims have been executed with precision. Late in March, Uganda police announced the arrest of several suspects in the gunning down of Assistant Police Chief Kaweesi. They were arrested across the country, but notably in Kampala city, the Kenya border town of Busia, and the DRC border area of Kasese. All those arrested are Muslims. A senior security official who declined to be named told New African that the killing of Kaweesi was meant to send a message to the government that despite the arrest in Tanzania of their leader, Jamil Mukulu last March and his extradition to Uganda, the rebel group is still alive and kicking. Mukulu is being held in Kampala’s Luzira prison. He is facing a number of charges including terrorism, murder and torture. Police chief General Kale Kayihura says the killers of Kaweesi had earlier sent a message warning that they (the killers) would inflict “pain deep in the police heart”. This followed the police raid on a Kampala mosque and the arrest of scores of Muslim leaders on suspicion of complicity in the murders of prominent Muslim leaders who had denounced and opposed the ADF. The police also claim that they recovered guns and ammunition during the raids, an allegation vehemently denied by the Muslim leaders. A government minister, Al Hajj Abdul Nadduli, condemned the police raid on the Nakasero Mosque in Kampala and dismissed the police allegations on guns and ammunition as a fabrication. “The purported guns are an attempt by the police to show that they are doing something to end the killings. They planted the guns in the said mosques,” said Engineer Abdul Maganda, a prominent Tablighi sect follower. Prominent Muslim clerics, including Sheikhs Yunus Kamoga, the Tablighi sect leader in Uganda, and Yahaya Ramadhan Mwanje, who assumed leadership of the sect after Kamoga was detained, have also been arrested on charges of complicity in the murder of Maj. Kiggundu. The murdered policeman, Kaweesi, 43, was a rising star in the police establishment and widely expected to become the next police chief. His killers blame him for being behind the attacks on the mosques and the arrest of preachers. A UPDF senior officer who refused to be identified says they expect an upsurge in ADF attacks following its recent pact with al-Qaeda and al-Shabaab in neighbouring Tanzania. The officer, a military intelligence colonel, says Mukulu was arrested in Tanzania where he had gone to meet al-Shabaab, whose operatives in 2015 gunned down Joan Magezi, the government prosecutor in a case where al-Shabaab suspects faced charges of terrorism for the 2010 killing of 74 people in Kampala. Last July, the High Court in Uganda’s capital found five of the 13 suspects guilty of murder and terrorism. Three of them were handed life sentences, one was jailed for 50 years, while the other got a lighter sentence of community service. The continuing murder of prominent people has exposed the inability of the country’s security forces to deal with the crime. Since the first killing in 2011, the police have not made any significant arrests, triggering fears that more killings of a similar or greater magnitude are in the offing, since the perpetrators of the murders are at large. For many Ugandans the question is: If a top cop can be killed in this way, how safe is an ordinary Ugandan? Why is economic suppression still a present discussion in South Africa?